The hanging of the Capitol Christmas Tree lights is the job of the Architect of the Capitol (AOC) Capitol Grounds Division. "When the lights of the Capitol Christmas Tree are finally turned on, everyone has that 'ahh' moment," says Tree Surgeon Supervisor George Rollins. Rollins has served with the Architect of the Capitol for 30 years and the moment of the official Christmas tree lighting by the Speaker of the House each year never gets old. It's when the hard work that the AOC has been performing — around the clock and behind the scenes — finally pays off. The Capitol Christmas Tree tradition has been an Architect of the Capitol responsibility for nearly 50 years. In 1964, House Speaker John W. McCormack suggested to Architect of the Capitol George Stewart that a Christmas tree be placed on the U.S. Capitol Grounds. That year, a live 24-foot Douglas fir was purchased for $700 from Buddies Nurseries of Birdsboro, Pennsylvania, and was planted on the West Front lawn. 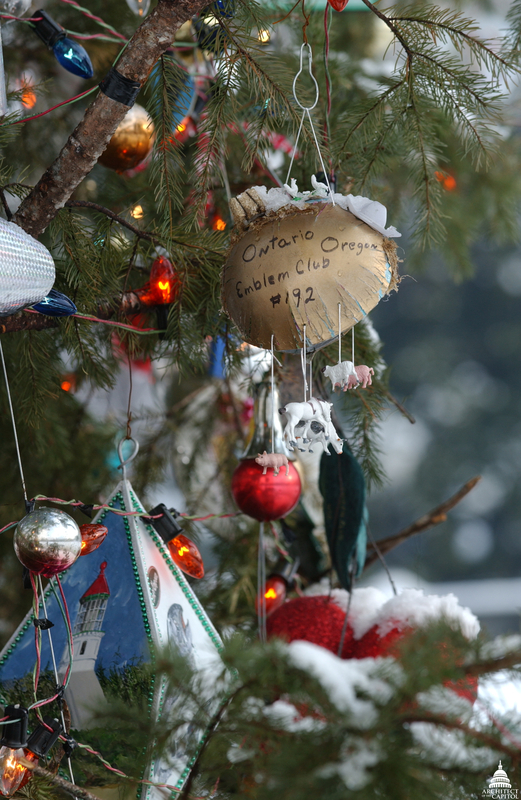 Each year through 1967, this tree was decorated and a tree-lighting ceremony was held. Unfortunately, due to a combination of factors — including a severe windstorm in the spring of 1967 and root damage — the tree died and was removed a year later. The 1968 Christmas tree was made from two white pines from Finksburg, Maryland, and was 30 feet tall; the 1969 tree was a 40-foot white pine from Westminster, Maryland. In 1970, the current tradition of the United States Forest Service providing the tree began. 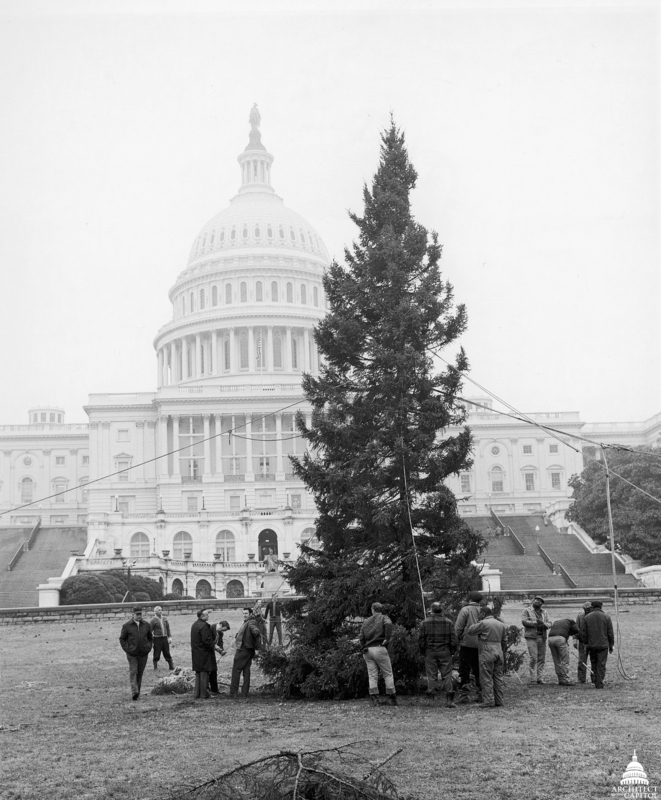 AOC workers anchored the 1971 Capitol Christmas Tree, a Black Spruce from New Hampshire’s White Mountain National Forest. Generally, the responsibility for providing a tree rotates through the nine national regions of the Forest Service. During the summer, the host Forest Service staff nominate about a dozen potential Capitol Christmas trees. These trees are carefully measured, photographed and mapped and this information is then shared with the Architect of the Capitol. Ted Bechtol, superintendent of the AOC Capitol Grounds Division, reviews this information when he visits each of the candidate trees to make the final selection. Bechtol considers many criteria when selecting the Capitol Christmas Tree. The ideal tree is 60 to 90 feet tall. It must be healthy, have good growth and density, and be rich in color. The tree must be straight and perfectly conical in shape. "It is positioned out in the open of the Capitol's West Front lawn, visible from 360 degrees," says Bechtol. "Unlike at home, you cannot hide the bad side of the tree in the corner of a room." The 2010 Capitol Christmas Tree from Wyoming made a stop in front of the Grand Tetons before its long journey to the U.S. Capitol. The Capitol Christmas Tree becomes the responsibility of the Architect of the Capitol when the U.S. Forest Service delivers it to First Street each year after the Thanksgiving holiday. The AOC Construction Division staff use a large mobile crane to lift the massive tree off of the trailer. From that moment, AOC staff has about 10 days to secure and decorate the tree before the lighting ceremony. Preparing the Christmas tree is a true team effort for the Architect of the Capitol. Once the tree is positioned in the center of the West Front lawn, it is lowered into a 4-foot hole. Then the AOC's Capitol Grounds Masonry Shop mixes concrete and pours it into the hole to anchor the tree firmly in place. Members of the Capitol Grounds Tree Care Branch then attach guy wires in two locations on the tree, which are then attached to four ground anchors, allowing the tree to be adjusted for straightness. Once the tree is in place, the AOC's High Voltage Shop provides electrical service and lights for the tree. The final step in the tree's preparation is the hanging of as many as 5,000 handmade ornaments by the Capitol Grounds crew. 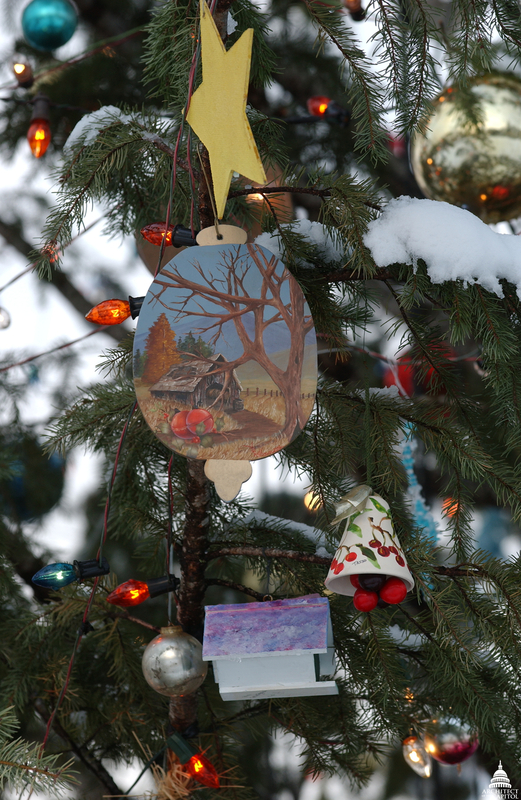 "The donated ornaments are made mostly by school children throughout the Christmas tree's home state. This makes the tree unique each year and more typical of an 'old fashioned' sort of style that many of us grew up with," says Bechtol. 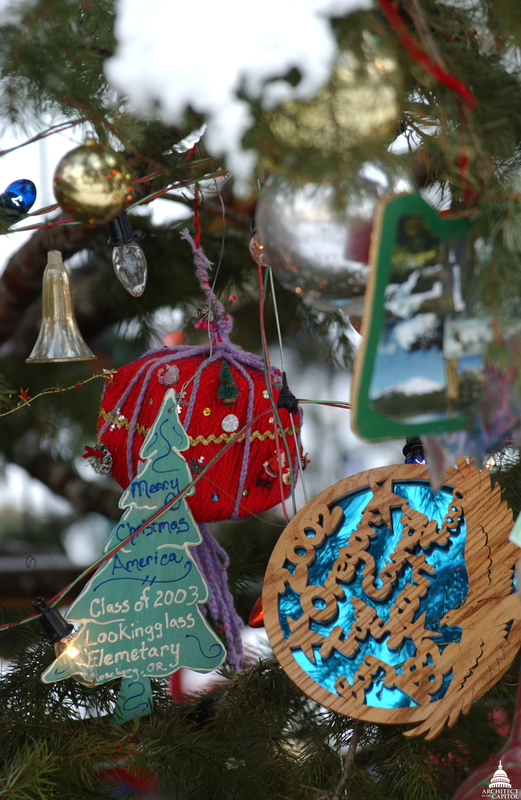 A close-up view of some of the unique handmade ornaments that decorated the 70-foot Douglas fir from Oregon’s Umpqua National Forest in 2002. Seeing the ornaments each year is also a favorite part of the process for Rollins. "I always enjoy the ornaments made by grade school children with pictures on them wishing us a Merry Christmas." The Speaker of the House then marks the start of the holiday season with the annual lighting ceremony. The tree is subsequently lit by the Architect of the Capitol each evening throughout the season for everyone to enjoy. This story is also published in the Fall 2011 issue of AOC's Foundations & Perspectives.